A 60-year-old male was referred for evaluation of elevated intraocular pressure (IOP) to 60 mmHg in the right eye (OD) with associated corneal edema. The elevated IOP was first discovered two months prior. He was treated locally with a laser peripheral iridotomy (LPI) and was started on bimatoprost and brimonidine/timolol. No family history of glaucoma or other significant eye disease. Aspirin, desvenlafaxine, sertraline, and rosuvastatin. He works as an engineer. There is no history of alcohol, tobacco or illicit drug use. Complete review of systems is negative except as stated in HPI. The patient presented with a history of episodic elevated intraocular pressure with corneal edema in the right eye only. His first visit at the University of Iowa Hospitals and Clinics (UIHC) revealed a normal intraocular pressure in both eyes on bimatoprost and brimonidine/timolol OD. The only pertinent exam findings were pigmented precipitates on the anterior trabecular meshwork OD on gonioscopy. There was no evidence of an inflammatory or infectious process which could result in a unilateral open-angle glaucoma. There was no history or stigmata of herpetic disease and no cell seen in the anterior chamber to suggest Posner-Schlossman syndrome. Additionally, there were no fine keratic precipitates or iris heterochromia with normal iris architecture and no neovascularization to suggest Fuchs heterochromic iridocyclitis. Additionally, if the angle pigment was caused by the laser peripheral iridotomy (LPI) that was performed in 2013 we would have expected the pigment to layer over the pigmented trabecular meshwork. Fortunately, the IOP was currently well-controlled and there was no evidence of glaucomatous damage. He had a healthy optic nerve head with no cupping. Ancillary testing revealed a healthy retinal nerve fiber layer (99 microns OD and 110 microns OS) on optical coherence tomography (OCT). His Humphrey visual field testing demonstrated non-specific paracentral depression in the right eye and a full field in the left eye. The patient was continued on his current regimen of glaucoma medications and a plan was made to treat with aggressive topical steroids should another flare occur. The syndrome of precipitates on the trabecular meshwork, also known by the eponym 'Grant syndrome' was first described by Paul Chandler and W Morton Grant in their 1965 textbook -Lectures on Glaucoma . This is thought to be a unique inflammatory glaucoma with no other significant evidence of anterior segment inflammation. The only evidence of inflammation in these patients is the precipitates found on the trabecular meshwork. This condition typically presents in older individuals (>50 years old) and there is a female predominance in most cases (79%) as described in a case series of 14 patients by Roth and Simmons in 1979 . The precipitates were found bilaterally in 86% of patients and the range of intraocular pressure was from 30-70 mmHg, with a potential difference of up to 20 mmHg between eyes. There are described systemic conditions associated with Grant syndrome including sarcoidosis, rheumatoid arthritis, and ankylosing spondylitis [3,4]. The precipitates themselves are described as grey or slightly yellow, and have a tendency to be slightly broader and flatter than those that might be seen on the cornea [1-3]. There has been no association with the number of precipitates and the degree of elevation of intraocular pressure. There may be only a few precipitates seen with an intraocular pressure in the 40s-50s. Given the subtle appearance, Chandler and Grant stressed the importance of careful gonioscopy. Cohen et al, suggest that ultrasound biomicroscopy of the anterior segment may be used as a supplemental tool to detect subtle precipitates in Grant syndrome . The underlying mechanism for elevated intraocular pressure in this patient population is thought to be similar to that of other uveitic open-angle glaucomas – namely trabecular swelling, trabecular obstruction with cell/debris, and/or trabecular hyalinization . Management of Grant syndrome primarily consists of controlling inflammation. In the series by Roth and Simmons, all 14 patients in the series presented as failures to conventional maximum medical therapy. They elected to use hourly topical 0.1% dexamethasone and oral acetazolamide at a dose of 250 mg every 6 hours. This was continued for 6 weeks and at that time point 86% had an intraocular pressure in the 20s or lower. In the long-term follow-up (2-16 years) of the series, 64% had recurrence of the glaucoma . One should consider the use of aggressive topical corticosteroids in patients with Grant syndrome. Additionally, aqueous suppressants should be considered for long-term IOP control in patients with persistently elevated intraocular pressure after the inflammation is controlled . Also, as the inflammation has a tendency to recur, regular follow-up is recommended. Our patient was already controlled without steroids. This may be a somewhat atypical presentation of Grant syndrome or perhaps the inflammation had run its course. We have not yet seen the patient back for follow-up to assess for any recurrences. Chandler PA, Grant WM: Lectures on glaucoma, Philadelphia, Lea & Febiger, 1965. Roth M, Simmons RJ. 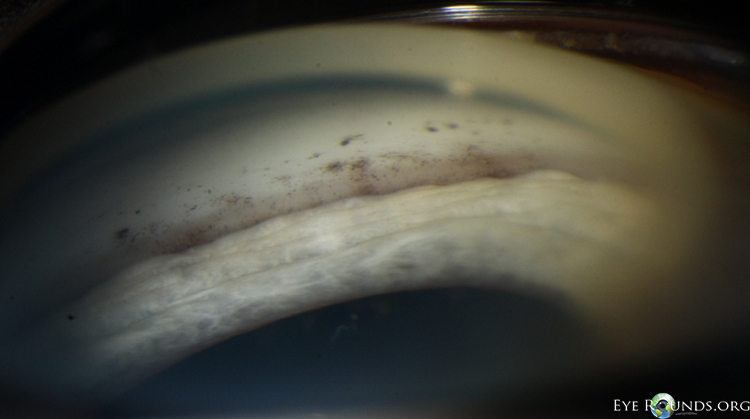 Glaucoma associated with precipitates on the trabecular meshwork. Ophthalmology. 1979; 86(9):1613-9. Cohen RG, Wu HK, Schuman JS. Glaucoma with inflammatory precipitates on the trabecular meshwork: a report of Grant's syndrome with ultrasound biomicroscopy of precipitates. J Glaucoma. 1996; 5(4):266-70. Shields MB. Textbook of Glaucoma. Fourth ed. Baltimore, Williams and Wilkins, 1998. Alward, WL. Glaucoma the Requisites in Ophthalmology. St. Louis, Mosby, 2000.